In this section of my creative Valentine ideas, I have collected a couple of beautiful homemade Valentine ideas - Valentine flowers. Presenting flowers and preparing homemade flowers are not unique ideas for Valentines Day, yet flowers are one of the most popular and best presents – and this is not an accident. The homemade Valentine flowers on this page look really wonderful so you will surely impress your loved one. Egg-box daffodil, origami rose, salt dough tulip and sunflower – these are the Valentine ideas that you will find below. Even though presenting flowers are not the most unique ideas for Valentines Day - these homemade flowers are truly creative valentine ideas. Simply scroll down to read the step-by-step instructions for these Valentines Day creative ideas. Now watch the following video carefully for the instructions on how to make this nice Valentine flower - the origami rose. Video is only about the flower part. Step 1. 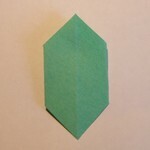 Get a 3×3 cm sheet of green paper. Step 2. Now fold it in half. Step 3. 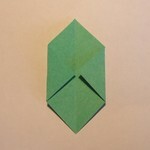 Next, fold the two ends in the middle to the crease as shown on the photo below. Step 4. Turn over the paper and voilá! There is your leaf! Step 5. Repeat steps 1-4 in order to make a few more leaves. Now the first of the Valentine flowers is ready. It is really one of the unique ideas for Valentines Day. Do you agree? 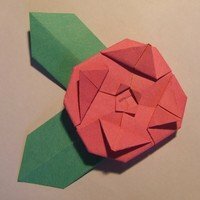 Are you interested in preparing one of the most unique ideas for Valentines Day - the egg-box Daffodil? The good thing about salt dough is that, in first place, it's unbelievably easy to make, and secondly, you can always transform it to another shape, unless it has totally dried out. But luckily, it takes quite a long time. In addition, despite of the simplicity of the the salt dough technique, you can make maybe the most beautiful Valentine flowers using salt dough! You should definitely try it! Just scroll down to see the three salt dough creative valentine ideas below with all the necessary instructions. IMPORTANT NOTE: to make the actual salt dough, you'll need 1 cup of salt, 2 cups of flour and 1 cup of water. First, mix the salt with the flour and then add the water. So now, we can start! Watch the following video for the step by step instructions on how to make the actual salt dough, and afterwards it'll explain the making process of the sunflower. Step 1. Get your stick and place it in a ball of salt dough. Step 2. Make the leaves and attach them to the stick. Step 3. Fix a small ball to the stick and put the petals around it. Step 4. Here is the finished Valentine flower. Leave it on a heater until it dries out completely (1-2 days) Step 5. Paint your Valentine flower using the acrylic paints. Be creative: use different colours than I used! Step 6. 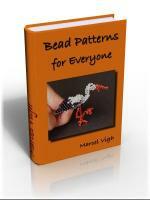 Allow the paint to dry (varies with every paint). And now your Valentine flower is done! Step 1. Make a sort of ball for the bottom of the flower. Put the stick in it. 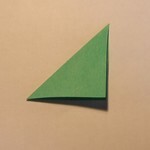 Next, make the two leaves as shown. Finally, fix the them to the stick Step 2. 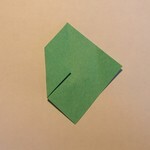 Create the top of the Valentine tulip as shown. Fix it to the stick like before. Place the tulip on a heater until it dries out entirely (1-2 days). Step 3. 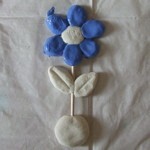 Paint your completely dry Valentine flower using the acrylic paints. 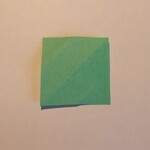 Be creative: you don't have to use the same colours I used! Have you found your favourite among the homemade valentine ideas above? They are truly creative valentine ideas and unique in they appearances. Your sweetheart will love them.